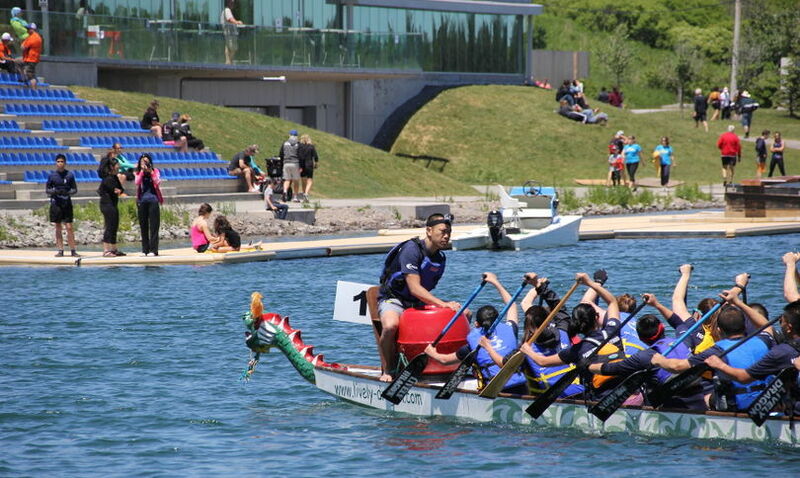 All teams registered for The 17th Annual Welland Dragon Boat Festival must have a minimum of 8 and a maximum of 10 of each gender paddlers (please note this rule applies to mixed crews only. This rule does not apply to female-only division crews). A team must have a minimum of 16 paddlers (although 20 is recommended), and the number of team members must remain consistent for all races. Each team will also have 1 drummer and 1 steers-person (who can be provided). A team roster is allowed to hold a maximum of 24 paddlers, plus 1 drummer and 1 steersperson for a total roster allowance of 26 crew members. A team roster may include 1 team manager, 1 captain, both of whom may or may not be crew members, still totaling a maximum of 26 crew members (including the drummer and steers-person). Under special circumstances, and only by approval of the Race Coordinator, a team roster may be expanded to 28 total team members. An example would be an organization where team members are required to work shifts and/or weekends. 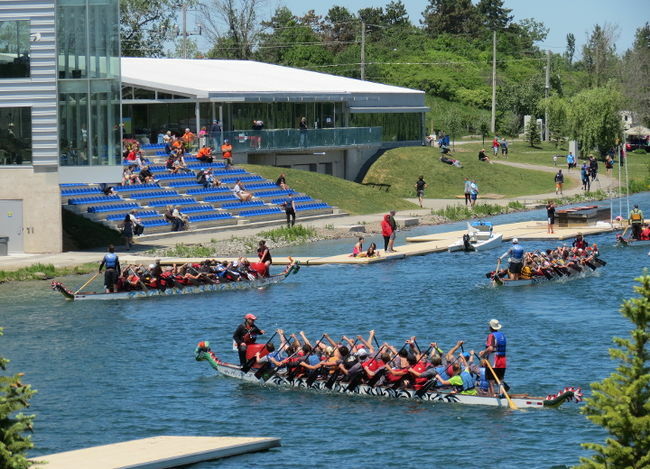 Requests for an expanded roster must be faxed (905-732-0212) or e-mailed info@wellanddragonboatfestival.com to the event office. A registered team member must be fourteen (14) years of age or older in the year of competition and no team member under the age of eighteen (18) will be allowed to practice or race without written consent and a waiver signed by a parent or legal guardian. 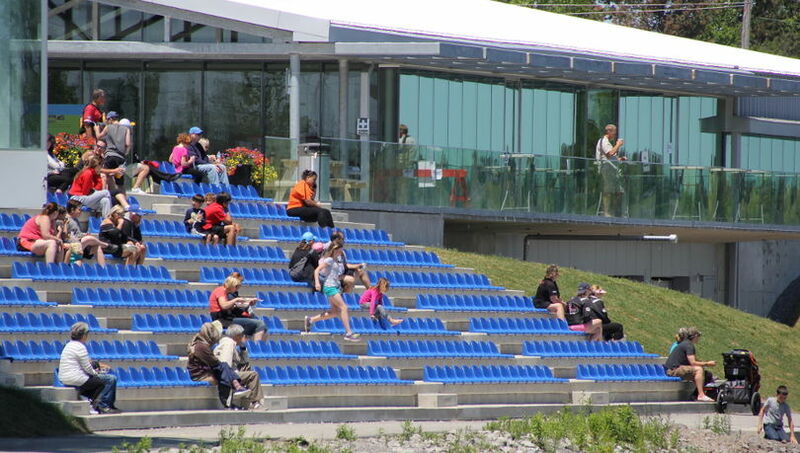 Please contact the event office 905-732-5337 x125/ info@wellanddragonboatfestival.com for the required documents. A final team roster, PAYMENT, along with outstanding individual waivers, must be submitted to the event office by May 18, 2018. Teams will not be permitted to race if all the team waivers, matching the team roster, have not been submitted to event officials. AN INDIVIDUAL MAY ONLY REGISTER AS A PADDLER FOR ONE TEAM AND PADDLE ONLY FOR THAT PARTICULAR TEAM. Drummers and steers-persons can be either male or female and may participate on other teams in that capacity. They may also participate as a paddler for their team (i.e. 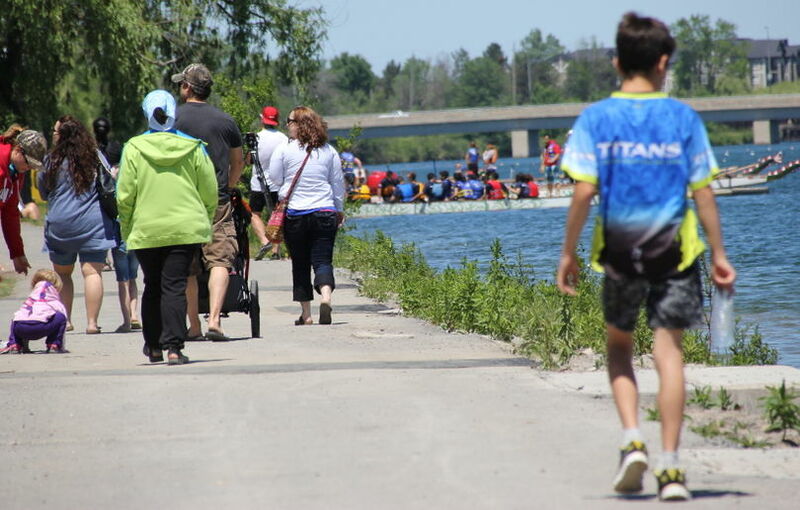 : switching spots with another registered team member) or may choose to register and participate as a paddler for another team during the event (not both). 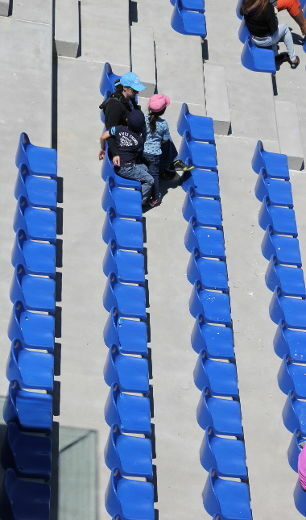 The Team Captain/Manager shall be responsible for the conduct of her or his team and for communicating and distributing all practice and race information to the team. She/he is responsible for collecting and submitting all forms and waivers and submitting them to the event office located at 26 East Main St. in Welland by May 18, 2018. Each team member MUST sign an Individual Athletic Waiver. In addition, the Team Roster needs to be signed by the responsible individual for each team prior to participation in any practice session or race. The team manager is responsible for duplicating, distributing and submitting all signed waivers to the event office prior to the first practice session. Be aware of forecast weather conditions during practices and on race day. The Practice Supervisor will be responsible for the suspension or cancellation of practices due to hazardous weather or marine conditions. In this case, attempts will be made to re-schedule the practice however, this provision is based on availability. A safety boat and referee boat will follow each race. 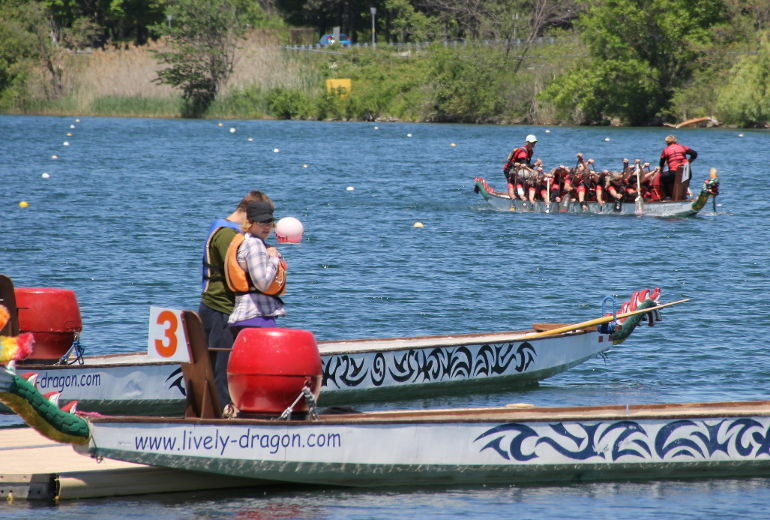 If your dragon boat veers off course or becomes swamped, please remain with the boat and wait for the referee and/or safety boat to arrive. Follow their instructions! 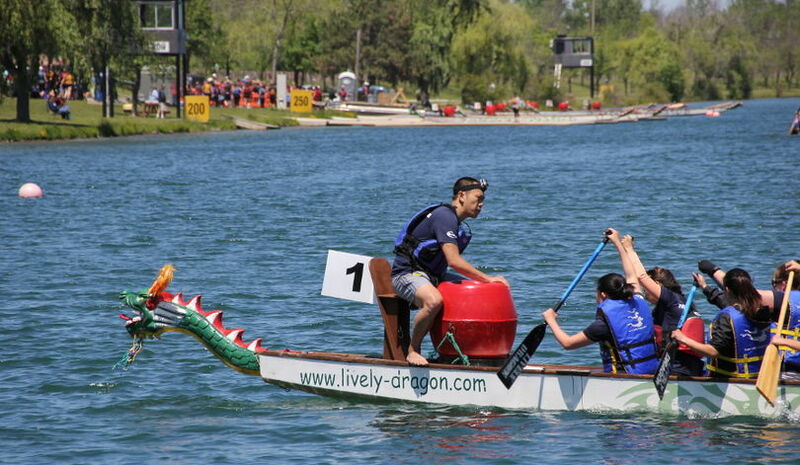 The Welland Dragon Boat Festival will be using World Championship fiberglass dragon boats. 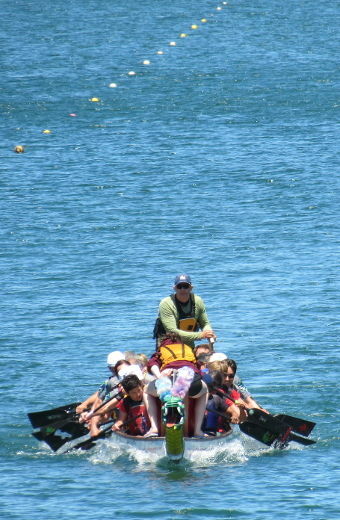 Each boat is fully equipped with dragon head and tail, paddles, steering oar and drum. Paddles will be supplied, as required. Teams may use their own paddles as long as they conform to required specifications. 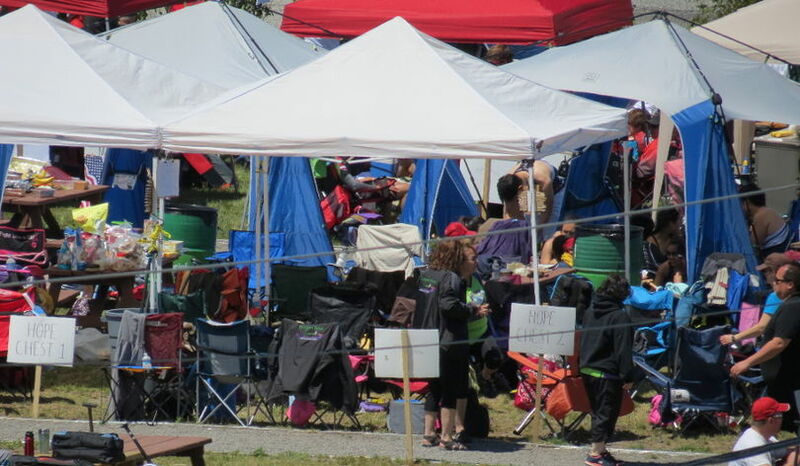 Any unmodified Grey Owl dragon boat paddle or any paddle supplied by race organizers will meet event specifications. No substitutions! 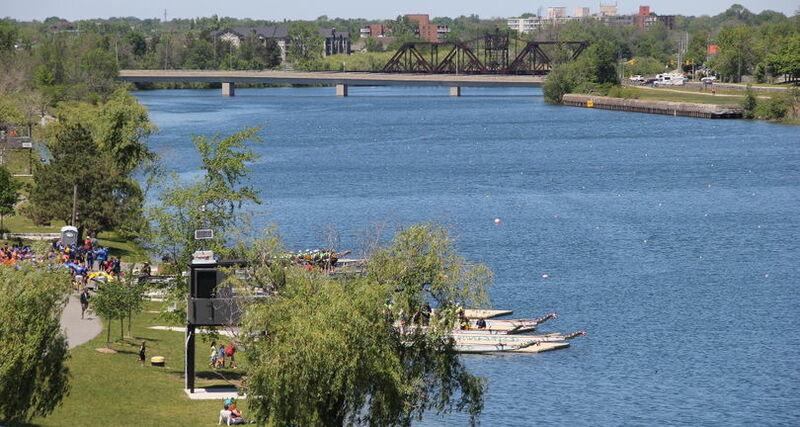 The Welland Dragon Boat Festival is being held on the Welland Recreational Canal. The racecourse is a certified 500-metre course, clearly marked with neon buoys. Electronic timing with manual back-up and finish line video replay will record official race times and placing. The start sequence of the race will be controlled initially by the referee who will in turn hand the race over to the starting official. The referee will direct the teams to start line (pre-start position). Once each boat is in the pre-start position the referee will hand the race to the starter. As soon as all boats are aligned and stationary at the start, the starter will voice the command, “ATTENTION PLEASE” and within a 2 second period the start cannon will fire. 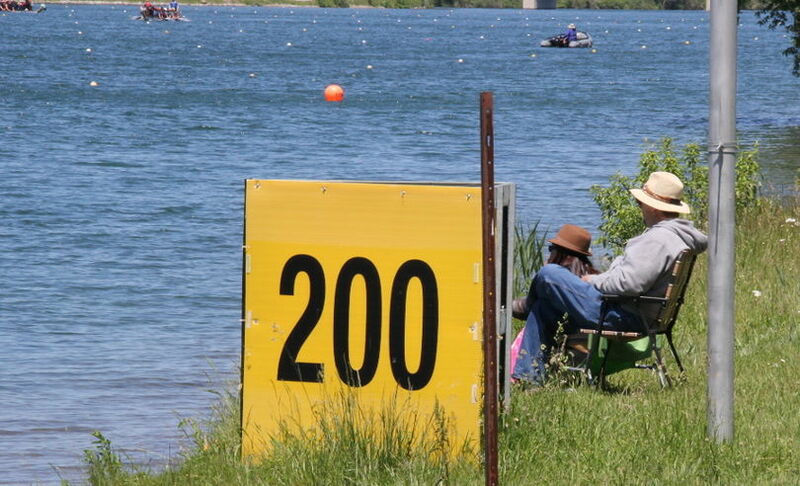 A five (5) second penalty will be issued to any team that begins paddling, in whole or in part, prior to the start cannon. In all cases, the starter can call back the race for a re-start. Once a race has begun, each team is responsible for remaining in the centre of their respective lane until they cross the finish line. A team that wanders outside the racecourse or into another lane may be ‘disqualified’ (DSQ), particularly if they interfere in any way with the progress of another boat. A team that enters into another team’s lane but does not interfere with the progress of another boat, may continue but will be disqualified if the team does not cross the finish line in the team’s own lane. The referee, whose decision is final, without appeal, makes the decision as to whether interference has occurred. 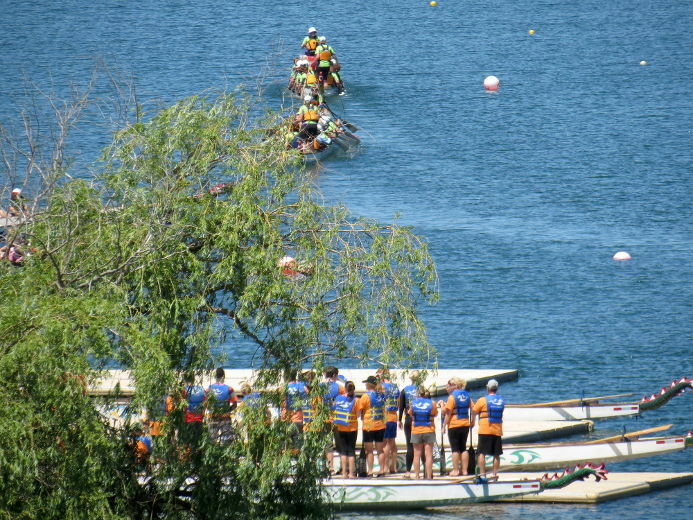 A team that is interfering or is about to interfere with another boat may be told to stop their boat by a race official. If the team does not stop their boat they will be disqualified. The finish line is marked with RED buoys. 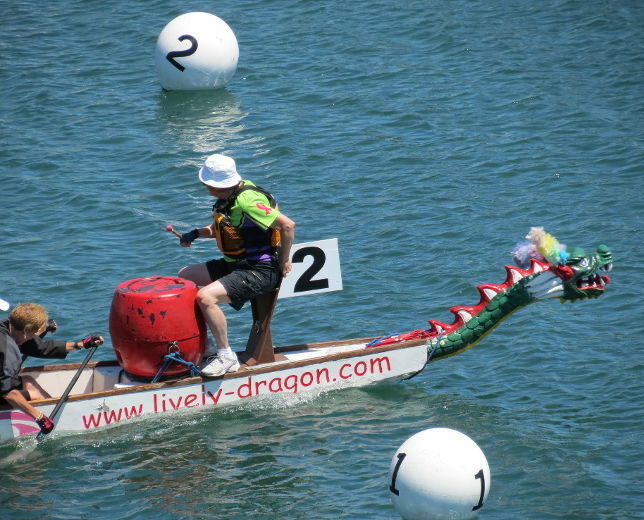 The finish of each boat is recorded as the dragon’s nose breaks the plane of the finish sight line approximately 1 metre behind the red buoys. All crew members must be in the boat at the end of the race or the boat will be recorded as ‘Did Not Finish’ (DNF). The decision of the judges is final. 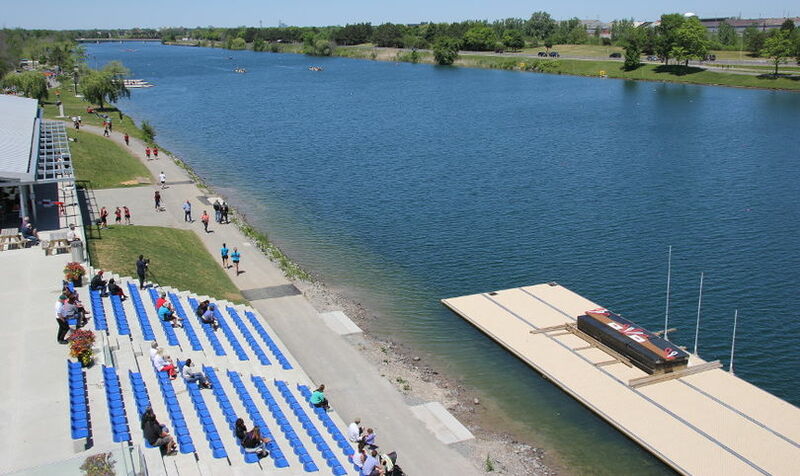 Upon completion of their race, all crews must return immediately to the dock mooring area and follow the instructions of the dock marshals so that the next heat can begin on schedule. Official times and finishing positions will be announced as results become available and will be posted at Race Headquarters and in the vicinity of the team marshaling area. Team advancement into divisional semi-finals will be posted as soon as they are determined by qualifying heats. The race schedule will be available on the website www.wellanddragonboatfestival.com one week prior to the event or by faxing in your request for a fax copy to event office at fax number 905-732-0212. It will also be posted on race day. Each team will race three times on Saturday in qualifying heats and subsequent seeding of teams for divisional semi-finals and finals. NOTE: Adjustments to the racecourse, times and practice/race schedule may occur due to a number of circumstances including weather, daylight, safety, etc. These adjustments are a part of the event and are at the sole discretion of the Race Committee/Organizers and are final, without appeal.